I tried, unsuccessfully, to get a bottle of Beaujolais Nouveau for our Thanksgiving dinner last week. Unfortunately it was still a little too nouveau and we were unable to get our hands on a bottle. The other day, however, I was able to get a bottle. The only problem was that now I had to plan a dinner around it. I only had 35 minutes to make dinner so it would have to be fairly simple. 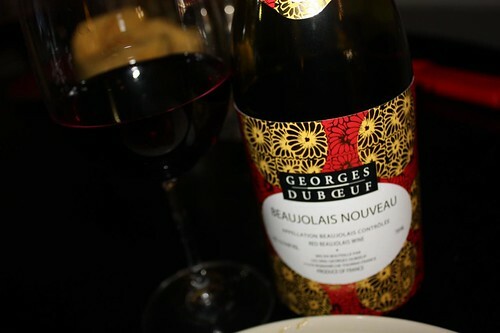 According to Wikipedia Beaujolais Nouveau goes well with roasted and grilled meats. That's right, I used Wikipedia to figure out what to make for dinner. Since I'd narrowed down the spectrum of accompaniments to merely all grilled and roasted meat in the world it was pretty simple to decide on making a simple roast chicken. 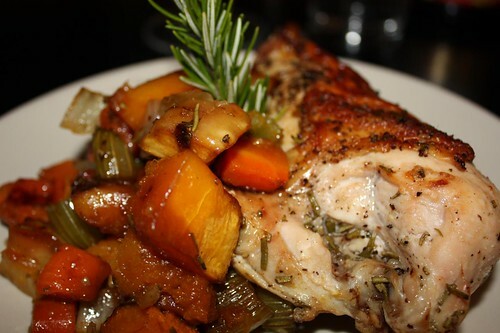 I seared it with some rosemary, salt, pepper, and olive oil and roasted it in the oven with some onion, celery, carrots, garlic, and butternut squash. The Beaujolais Nouveau was as I remember it: not that great. I'd heard rumors that this year's batch was supposed to be the best in the past forty years. Perhaps. It's hard to tell because this particular wine is not a personal favorite. The only thing I've ever enjoyed about Beaujolais it he ability to describe it as 'foxy' and to be technically accurate. It's good to be able to say I've had the best vintage of Beaujolais in forty years. Better still is the phenomenal translation job they did on the back of the label. I can't tell if my favorite part is the grammatical structure of the 'sentence' or the fact that they flat out forgot to translate the word primeurs. Actually it's neither. It's still my opportunity to use the term 'foxy' again. That was one foxy wine. 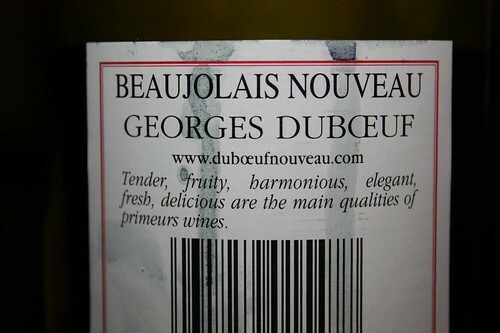 I like Beaujolais very much, Nouveau not anywhere quite so much. Think it is a clever marketing ploy to get people to buy vinegar at inflated prices. That's what I kept saying! "This smells like vinegar!" I might be a Phillistine, though. Being a Philistine might run in the family. Like good taste.